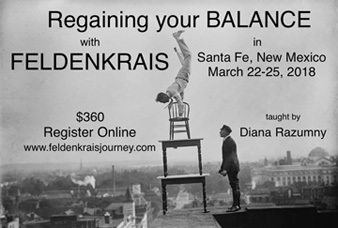 These 12 Awareness Through Movement® lessons were taught live in a 4-day workshop entitled Regain Your Balance Through the Feldenkrais Method® taught by Diana Razumny in Santa Fe NM in March of 2018. This lesson series (and the discourse not recorded) helped participants appreciate the power of the Feldenkrais Method for exploring balance and stability. Strong themes visited repeatedly were the feet, head, eyes and walking. For those interested in the sources of the lessons, they were taken from Dr. Feldenkrais’ large body of work called Alexander Yanai, Mark Reese and Gaby Yaron.